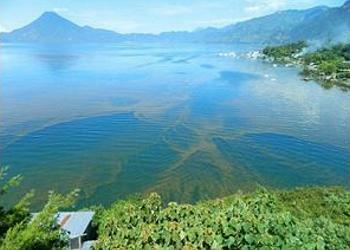 PANAJACHEL, Guatemala, August 20, 2015 (ENS) – A thick bloom of algae known as cyanobacteria appeared in Lake Atitlan on August 3, the first such occurrence since 2009. But help appears to be on the way in the form of funds to upgrade the waste water treatment system and water supply in the Atitlán basin. Located in the Guatemalan Highlands of the Sierra Madre mountain range, Lake Atitlan is the deepest lake in Central America and one of the most beautiful. The surrounding area became a national park in 1955. An infestation of microalgae is considered a bloom when the concentration reaches two million parts per liter, and scientific tests demonstrate that this is a bloom unprecedented in modern history. A series of water samples taken by the Watershed Authority, AMSCLAE, in association with the University del Valle de Guatemala, Altiplano Campus, revealed that there are five major types of phytoplankton in the water. Three of these – Dolichospermum, Limnoraphis and Microcystis – are classified as cyanobacteria. The eutrophication, or excessive nutrient richness of the lake, is the main cause of this bloom, the scientists say. If left unchecked, they warn, the Microcystis cyanobacteria will cause toxification of the lake, making it unsuitable for human use. This has already happened at neighboring Lake Amatitlán. The nutrients come in the form of waste water entering the lake untreated, as well as the inappropriate spreading of industrial fertilizers on cropland, which then enter the water supply. To clean up the current bloom and prevent future occurrences, waste management and water treatment are two of the most important issues the 15 municipalities in the Lake Atitlán basin must face. But in an underdeveloped country like Guatemala, there are both practical and political hurdles to full implementation of a comprehensive water treatment plan for Lake Atitlán. According to Ana Lena Katt, director of social communications at AMSCLAE, there are only waste water treatment plants at 11 of the 15 pueblos in the Atitlán basin. Scientist Ivan Azurdia, executive director of AMSCLAE, says the funds have existed for seven years to upgrade the entire waste water treatment system and water supply in the Atitlán basin. “Working through the United Nations and the IDB [Inter-American Development Bank], Spain has given Guatemala a donation of US$50 million, matched with another US$50 million in the form of an IDB loan,” Azurdia says. There are three organizations that must harmonize in order for the master plan to work – Instituto de Fomento Municipal, INFOM, a governmental body on the national level, the United Nations Office for Project Services, or UNOPS, and the Inter-American Development Bank. Finally, on August 18, bowing to public pressure, INFOM signed the document that will free the funds for implementation of the master plan. But now the race against time has begun. 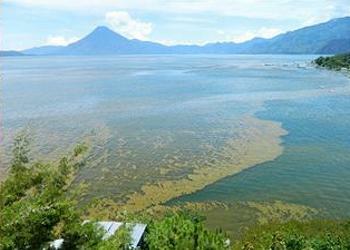 Now, the real work begins to implement a long-term strategy to save Lake Atitlán, one of the world’s natural treasures.